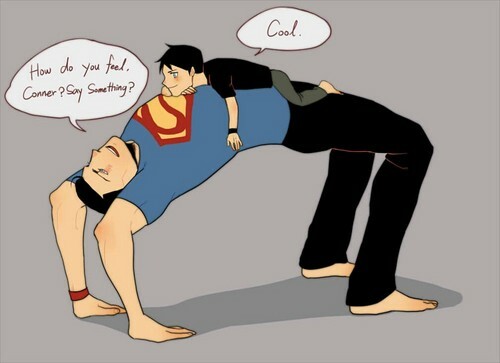 सुपरमैन and Younger Superboy yoga interruption. I'm a sucker of सुपरमैन and Younger Superboy bonding. HD Wallpaper and background images in the यंग जस्टीस club tagged: young justice superboy superman conner kent clark kent. This यंग जस्टीस photo might contain मोबाइल फोनों के लिए, हास्य पुस्तक, मंगा, कार्टून, एनीमे, कॉमिक बुक, and manga.